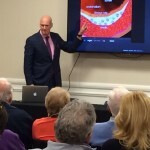 Dr. Jeffrey Fenster was the featured speaker last night at Jupiter Medical Center’s Cardiac Rehabilitation Center. 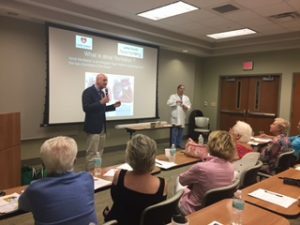 He and invited guest Dr. Simi Platt spoke on the features, symptoms, signs, and treatments for atrial fibrillation (also known as “afib”). As a board-certified cardiologist and invasive cardiologist, Dr. Fenster spoke about the signs and symptoms of afib – how to recognize it, when to see a doctor, the various medications used to treat chronic afib, the benefits and risks of those treatments, and other aspects of the medical management and day-to-day living issues incurred by afib. As a well-respected electrophysiologist in the northern Palm Beaches, Dr. Platt focused on the invasive treatments of afib – which patients are ideal candidates, when and how the various invasive treatments may be successful, and where and how the procedures are performed. Speaking to a capacity crowd, Dr. Fenster and Dr. Platt also answered questions from the 100+ people in attendance. 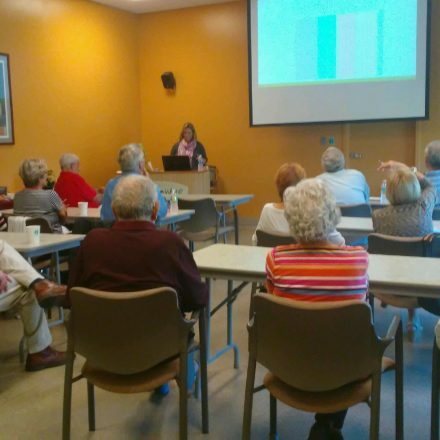 They look forward to continuing their relationship with Jupiter Medical Center and its wonderful cardiac rehab center. Please feel free to visit the Cardiac Institute of the Palm Beaches’ website to answer many of your cardiac questions: www.thecardiacinstitute.com. Or call us at (561)296-5225 to set up an appointment. The Cardiac Institute of the Palm Beaches offers free nutrition counseling to qualifying patients and soon will offer case management services to those participating patients who require social service assistance. We look forward to serving all of your cardiac needs.